The Pacific Wren is a small dark wren (8-12 cm long, 8-12 g) with a short stubby tail typically held in an upright and cocked position, and with a short slender bill. The color is fairly uniform dark to medium brown, becoming paler on the supercilium, chin, and throat, and with dark barring on the wings, tail and underparts (belly, flanks, crissum); sexes are alike in appearance. Pacific Wren was formerly considered a subspecies of Winter Wren (T. troglodytes), then split in 2010 based on voice, DNA, and subtle differences in plumage (more deeply rufescent). Pacific Wrens are distinguished from other sympatric wrens by usually smaller size, much shorter tail, and fairly uniform brown coloration. Their voice is more complex and modulated, and delivered more rapidly than by the Winter Wren, such that individual notes are difficult to follow and appreciate (Hejl et al. 2002). 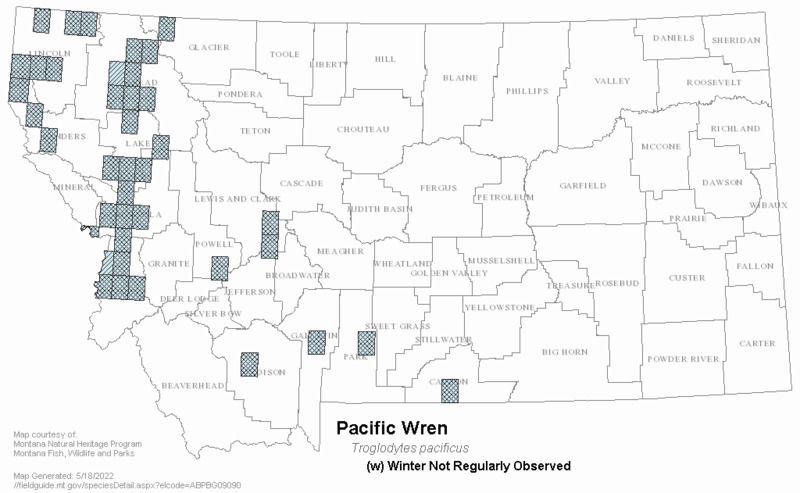 Winter Wren reported infrequently during migration in far eastern Montana. Click the map for more info. 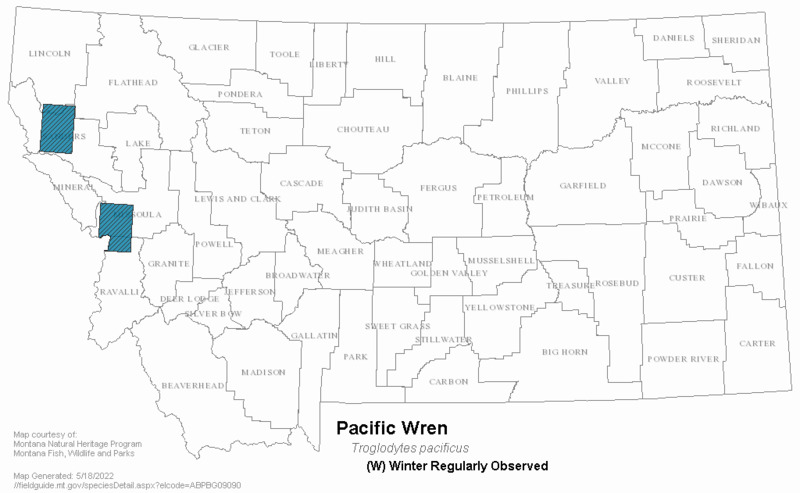 Note Pacific Wren and Winter Wren are both shown on this map. In 2010, the North American populations of Winter Wren (Troglodytes troglodytes) were split into two separate species: Pacific Wren (Troglodytes pacificus) (western USA and Canada); and Winter Wren (Troglodytes hiemalis) (eastern USA and Canada). The map for this species-pair was generated before the split, so it shows both of the current species in a single model. 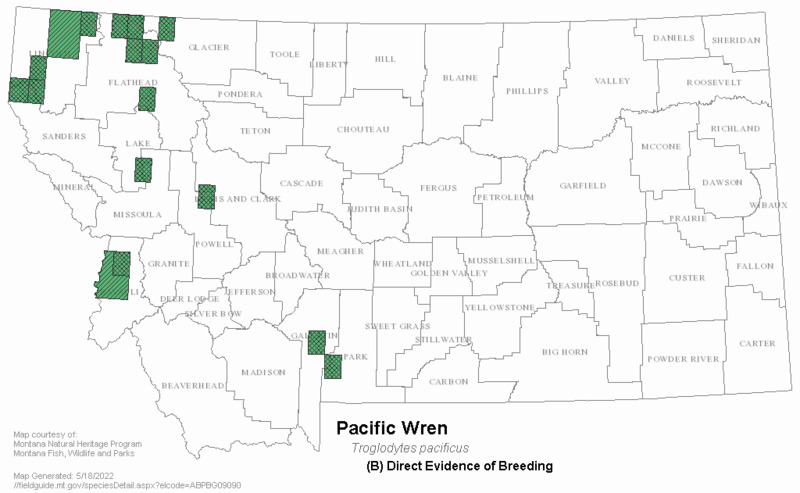 Pacific Wrens breed from southern Alaska (including the Aleutian Islands), southwestern Yukon, British Columbia, western Alberta, central Montana, and perhaps northwestern Wyoming south to central California, central Idaho, and northern Utah; an isolated breeding population occurs in central Arizona. Winter numbers are highest in the Pacific Northwest, but the species winters in most of the breeding range and sporadically in the other western states south to southern California, southern Arizona, and southern New Mexico. Permanent resident in the western half of Montana. Pacific Wrens prefer large uncut stands of old-growth and mature coniferous forests and also occur in riparian cottonwoods and aspens. In Montana they are especially common in cedar-hemlock, cedar-grand fir, and spruce-fir forests and are strongly associated with riparian areas within these forest types (Manuwal 1986, Hutto and Young 1999, Casey 2000). Snags, large trees, and downed woody debris are important components of breeding habitat. The nest substrate is highly variable and includes woodpecker cavities in trees, holes in dirt banks, niches in rotting trees, root tangles of fallen trees, clumps of hanging moss, and folds in tree bark (Hejl et al. 2002). Nesting and foraging typically occur within 2 m (6.5 feet) of the ground. In winter, Pacific Wrens use thickets in open forests and lower-elevation riparian areas in addition to large tracts of mature forests. Diet is comprised of invertebrates, particularly insects and spiders, and amphipods along the Pacific coast. Stomach contents (percent of 122 stomachs) from British Columbia included 66% beetles, 51% spiders, 30% moth and butterfly caterpillars, 23% mites and ticks, 22% bees, wasps, and ants, 14% flies, 11% pseudoscorpions, 10% millipedes, and 10% harvestmen. Fruits and small vertebrates (small fish, tadpoles, small frogs) are sometimes eaten (Hejl at al. 2002). The estimated density of Pacific Wrens along riparian corridors at Lubrecht Experimental Forest near Missoula went from 63 pairs per 40 ha in 1968 to zero in 1980 for reasons not determined (Manuwal 1986). 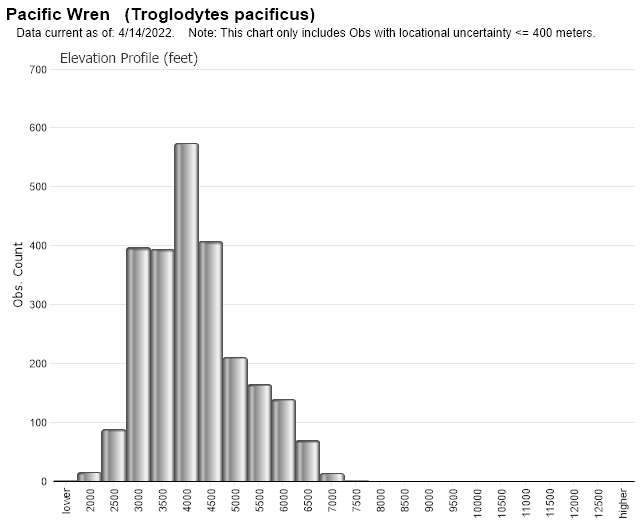 The BBS is not a good means of measuring population trends of Pacific Wrens in Montana, probably because few roads exist in the interiors of older forests. The data from 1980-2007 indicate that numbers were relatively stable to slightly increasing survey-wide. Christmas Bird Count (CBC) data show Pacific (Winter) Wren was reported all but one winter in Montana during 1979-80 through 2009-10, and showed wide fluctuations in numbers but with no particular trend; high total count was 22 (0.0128/party hour) on 8 counts in 2001-02, low total count was 0 in 1993-94. The highest single count was seven birds at Missoula on 15 Dec 2001. CBC occurrences east of the divide are very rare. The Bozeman count has been held annually since 1949, and Pacific Wrens were found only twice, on 21 Dec 1974 and 23 Dec 2006. Similarly, one found on the Helena count on 20 Dec 1997 is the only occurrence since the first count was held in 1954. The only other CBC record from east of the divide was on the Yellowstone National Park count (centered at Gardiner) on 20 Dec 1998. The species is double-brooded in some parts of its range. Laying of first clutches occurs from late April to mid-May, hatching from mid-May to early June, and fledging from early to late June. Flying young were seen as early as 26 June near Fortine (Weydemeyer 1975), adults tending recently fledged juveniles as late as 10 August (Montana Bird Distribution Committee 2012). Clutch size of 45 nests in Idaho was 3-7 eggs (mean = 5.7), incubation period averaged 16.5 days, fledgling averaged 16.8 days after hatching (Hejl at al. 2002). 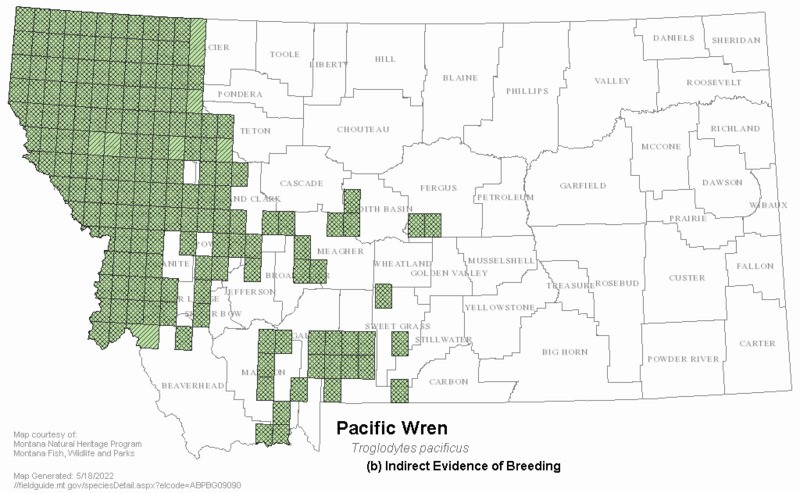 No management activities specific to Pacific Wren are currently occurring in Montana. Maintaining large blocks of unlogged old-growth and mature forest with high densities of large trees, dying trees, and snags would be especially beneficial to this species (Casey 2000, Hejl et al. 2002); production of even-aged forest stands is detrimental, as is removal of snags and downed logs. Pacific Wrens must have been much more abundant before the intensive logging of virgin forests that began with European settlement. Numbers can decline dramatically after even moderate levels of timber harvest (Hutto and Young 1999, Young and Hutto 2002). The species is negatively affected by forest fragmentation, logging activities that remove large trees, downed logs, and snags, and management that promotes even-aged stands (Hejl et al. 2002). Manuwal, D.A. 1986. Characteristics of bird assemblages along linear riparian zones in western Montana. The Murrelet 67(1): 10-18. Weydemeyer, W. 1975. 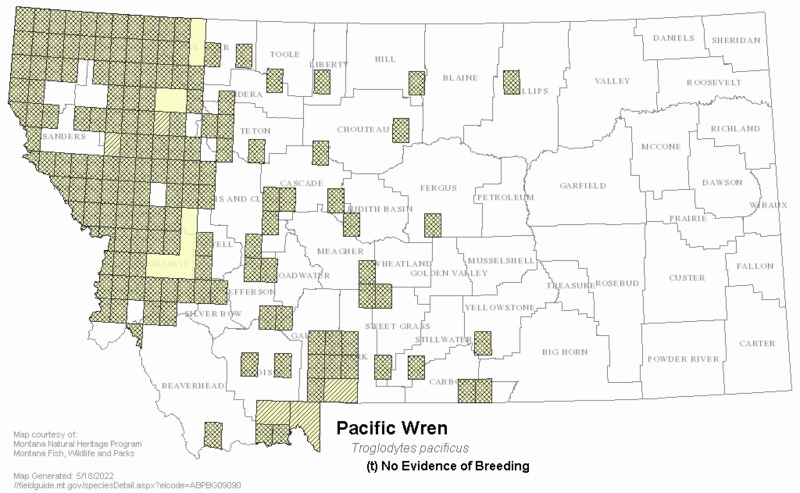 Half-century record of the breeding birds of the Fortine area, Montana: Nesting data and population status. Condor 77:281-287. Young, J. S., and R. L. Hutto. 2002. Use of a landbird monitoring database to explore effects of partial-cut timber harvesting. Forest Science 48:373-378. Web Search Engines for Articles on "Pacific Wren"